As more nonprofits, charter schools and networks, and district leaders have come to our Bellwether Talent Advising practice frustrated by lack of progress on their diversity, equity, and inclusion aspirations, we have articulated an approach called the Funnel of Impact. This approach helps organizational leaders to build and run educational equity organizations that are what we call “talent-ready,” organizations that live and act in deep alignment with beliefs around diversity, equity, and inclusion. Talent-ready organizations are innovative, effectively managed, great places to work that generate sustainable results for kids. Importantly, they also have durable and authentic relationships with the communities they serve so that they can effectively attract and retain a diverse talent base, ensure all people have development opportunities to optimize their potential in service of kids, and create a culture where diversity tangibly enhances the organization’s mission. What are our organization’s demographics and how representative are we of the communities we [seek to] serve? Is there a disconnect between the leadership demographics of our grantees and the communities that those grantees serve, and if so, how deep of a disconnect? What metrics might we look to at the organizational or field level to monitor progress? These questions are important to ask, but many organizations and funders stop here without recognizing that these questions take on demographic diversity without thinking further about the conditions which enable or inhibit that diversity. Ending at the surface level at the top of the funnel is the approach most commonly pursued, but the one least likely to enable action and drive change. Are we hiring for and rewarding white dominant speech patterns, approaches, and cultures? Are we equating assimilation into white dominant environments and navigation of white dominant cultural norms with success? To what degree do staff members and leaders from historically underrepresented groups experience an organization where they can bring their whole, authentic selves to work; perceive equitable practices; and witness the interruption of micro-aggressions without carrying the burden of initiating these interruptions? Have we prioritized, invested in, adopted, and held each other accountable for systems, processes, and behaviors that institutionalize equity? Have we enabled our leaders to spot for and guard against biases in their own practices around hiring, developing, and evaluating their people? While enabling more regional or school-based autonomy and control for key decisions and resource allocation, have organizations with national offices also put checks and balances for equity into place? These “why” questions serve to move deep under the surface and down in the Funnel of Impact, but by themselves, they are still insufficient to drive accelerated progress. How do we define “diversity,” “equity,” and “inclusion” and why? To what degree is this diversity, equity, and inclusion work important in the context of other competing priorities? What are we actually trying to accomplish and why does it matter? What investments, trade-offs, and even sacrifices are we willing to make in service of a diverse, equitable, and inclusive organization? 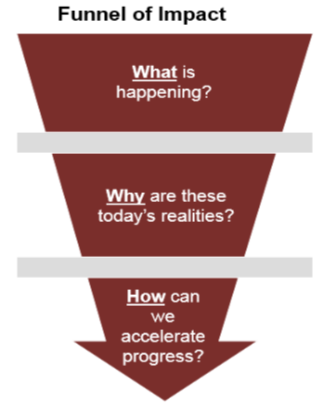 Only once we have answered these questions at the bottom of the Funnel of Impact, are we positioned to make real, accelerated progress toward bringing the organization into alignment with core beliefs.